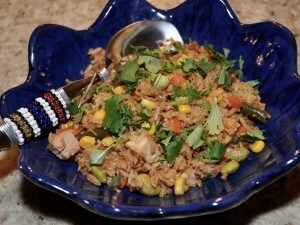 Today I want to share a simple fried rice dish that I made last night that my family really liked. When you order fried rice at a restaurant, there is a huge oil to vegetable ratio. The trick to making healthy—but no less delicious—fried rice is to flip that ratio on its head. This also happens to be one of the tricks to making just about any dish lower in calories and more nutritious. And if you’d like to eat more but weigh less, apply a similar algorithm to the relationship between the grain and vegetables in a recipe. Eating out? Ask that dishes be made with double the veggies and half of both the oil and grain or noodle—your heart and rear end will say thanks. Heat the olive oil in a large, deep skillet. Add the ginger and garlic, sautéing over low-medium heat for one minute. Add the broccoli and mushrooms and cook for three minutes. Add the rice and stir well. Add the edamame and mixed vegetables, mixing all to combine. Blend in the soy and teriyaki sauces as well as the toasted sesame oil. Let the dish cook for another several minutes, stirring occasionally. If using, mix in the chicken or tofu, keeping the pan cooking until they are warmed through. Taste and add additional soy and/or teriyaki sauce as needed. Add the snap peas, scallions, and sesame seeds. Combine and taste one last time for seasoning. If all is well, transfer to a serving platter and top with cilantro. (Use parsley or basil if you’re one of the people to whom cilantro tastes like soap.) Serve with Sriracha sauce. *If you’re using chicken or tofu that isn’t already cooked, just add with the broccoli. You may need to adjust seasonings since they won’t already have flavor. Just keep tasting! Tofu scares people. They envision a strange, tasteless cube of mealy weirdness and run, screaming. Done wrong, tofu can indeed be creepy. But, done right? It is delicious, people! Here is one easy way to prepare it that might make you reconsider. Since most Americans over-consume chicken and beef and would benefit from eating more plant-based proteins, think of it next time you’re meal-planning. *I store ginger root in the freezer, where it stays for months. To use, grate off as much as you need with a microplane. It is so easy, and ginger root lends incredible flavor to recipes. You can also grate up garlic cloves on it. Here’s a link to the one I use and love. 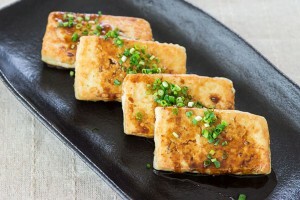 Slice the tofu block and lay slices on a large, clean kitchen towel that will absorb some of their water. Meantime, whisk together the remaining marinade ingredients. Pour half of the marinade around the bottom of a 9 x 12 glass baking pan. Lay the slices in the pan. Pour the remaining marinade over them. Cover the pan tightly with plastic wrap and refrigerate overnight, or at least for 4–6 hours. Heat a frying pan and add 1 tsp olive oil, swirl around when warm. Saute tofu slabs about 3–4 minutes per side. Sprinkle with scallion to serve. Serve with a complex carb such as brown rice and a side vegetable. This serves 3–4, so make two blocks and double the marinade if you have a bigger crowd. Wrap up leftovers and refrigerate for up to five days. They’re great to use up later, diced, either atop salads or stirred into a pot of vegetable soup. Let me know how it goes and if you’ve reconsidered your fear of tofu! At a shabbat meal at my culinarily gifted sister-in-law, Dalia’s, table, we were served homemade pumpkin butter to spread on our challah. Pumpkin is a vegetable, of course, and to see my kids slathering it thickly on their bread was a delight to someone who, like me, strangely delights in watching kids eat well. (Is that a thing?) Anyway, she sent me the recipe, which turned out to be adapted from Moosewood Restaurant Celebrates. My only tweak was to de-sweeten it a touch, since the aromatic spicing more than compensates, and we could all do with less sugar, especially our kids. Mine didn’t notice the difference. 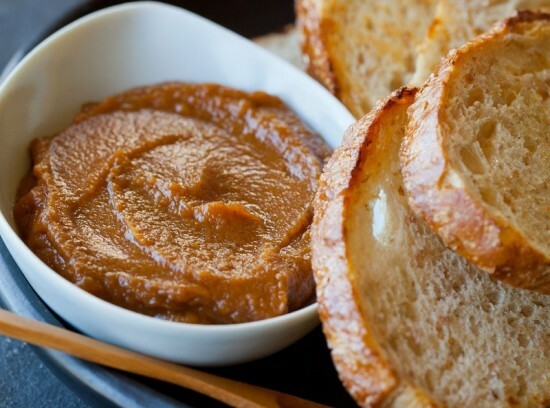 When I told a friend about this recipe, she said she always just bought the Trader Joe Pumpkin Butter, which she says is delicious and, obviously, easier. 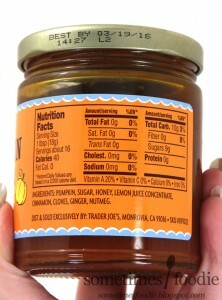 I checked out the label, though, and despite the short ingredient list, notice in the photo that both the second and third ingredients (and they are always listed in order of descending amount) are sugar and honey. (As far as your body is concerned, these are basically the same.) Then, notice that one tablespoon of the pumpkin butter contains 9 grams of sugar! That’s over two teaspoons of sugar in there! 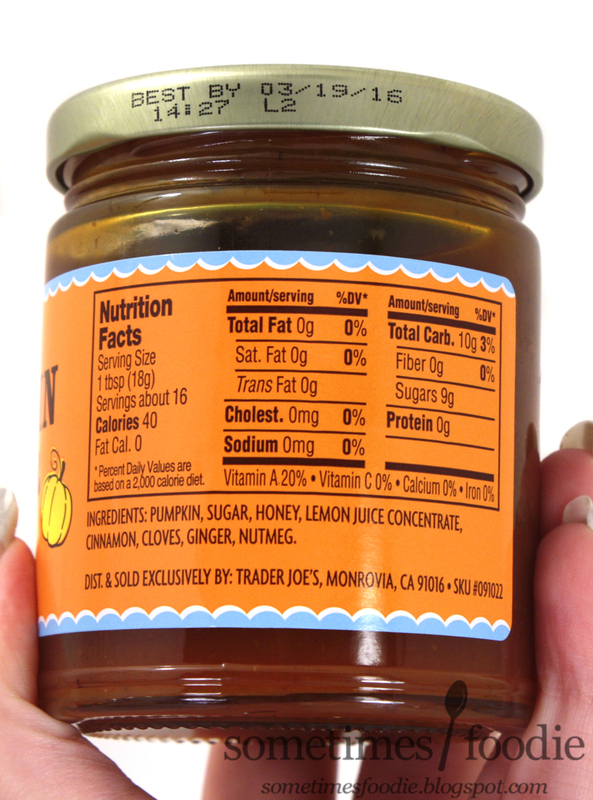 Since 1 Tbsp = 3 tsp, this means that 2/3 of this product is just sugar. Even though it requires more work, the recipe below features vegetable with a little added sweetener, rather than—as in the Trader Joe version—sugar with a little added vegetable! Preheat oven to 375F. Rinse off pumpkin, cut in half and scoop out seeds. Spray a baking sheet, place pumpkin pieces face down and roast for about 45 minutes until pumpkin is soft enough to scoop out. Roast the seeds separately, they are delicious: spread them on a baking sheet, lightly spray with olive oil, sprinkle a little salt, and roast at 350F until lightly browned. Let pumpkin cool slightly, then scoop out the flesh, and add to your food processor with all remaining ingredients. Puree till smooth, adding a little water if needed to get the right consistency. You don’t want it too liquidy, but it has to be spreadable. Transfer to a pot set on low, and simmer, covered, for 20 minutes. Add more lemon juice, if desired, and possibly a little more sugar, if you must. 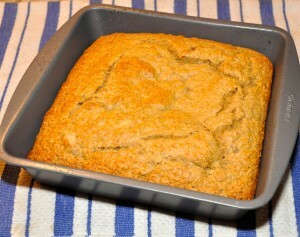 Cool and serve with whole-grain bread. Keeps in fridge for up to three weeks. I froze half and it defrosted beautifully. 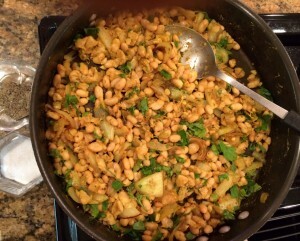 This mujadara recipe, adapted from Melissa Clark, is fast and easy, and it can work as a meatless entree, side dish, or lunch. 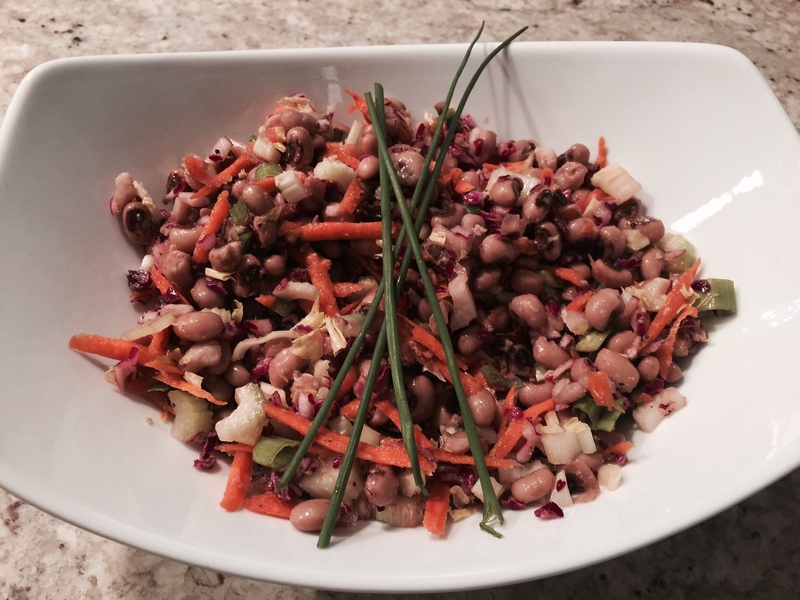 Whether or not you’re partying with vegans, all will love this aromatic dish, kids included. Mujadara is a Lebanese favorite based on lentils, rice, and onions. It can sometimes get too oily when prepared at restaurants; this version is light and gets it flavor from spicing, not excess fat. As an entree, serve it with a salad and steamed vegetables, and finish with fresh fruit. I like to make it early and park it on the counter, covered, for several hours to deepen the flavors before rewarming to serve. Heat 1 Tbs olive oil in a large pan until hot but not smoking. Add leek, turn fire down, and saute for 5 or so minutes, occasionally stirring. Add garlic cloves, cumin, allspice, garlic powder and cayenne; saute another minute. Add drained lentils, rice, water, salt and pepper, bay leaf, and cinnamon stick. Cover pan and simmer for about 15_–20 minutes until lentils and rice are tender, stirring occasionally. Add water if it’s getting dry. Add chopped greens and cook another five or so minutes until they look done. Remove pan from heat and let sit covered until ready to rewarm for serving. Remove bay leaf and cinnamon stick before serving. Once you transfer to serving platter, sprinkle with minced cilantro and pomegranate seeds. At Hillel Day School of Metro Detroit, I chair a Lunch and Nutrition Committee that recently interviewed food service providers to develop a healthy lunch program for the fall. Thanks to a generous donation, we have been able to install a state-of-the-art kitchen, and we are seeking a food service provider who can make wholesome, non-processed food tasty to even our pickiest eaters. Recently we had our first “tasting” and it was so much fun, and so delicious. The entire menu happened to be vegan, although the lunch program will not exclude animal foods, and we had four picky student testers come in—one of whom said he would never have eaten anything like this food before, but that, having tasted so many delicious samples, he just needs to tell his mom where to sign up because he’s “in”! More on this student in a moment, but as for today’s recipe, it’s a riff on a salad we sampled. I changed a few things, but basically, it’s any beans you like, a tiny dice of any crunchy vegetables, shredded carrot, salt and pepper to taste, perhaps some snipped basil or another herb, a light drizzle of olive oil, and a generous splash of apple cider vinegar. Mix well and let marinate for an hour or two before serving. Here is exactly what I put in mine this time, but please personalize. And don’t forget, beans are a nutrient-dense protein source if you’re finding yourself always relying on meat and fish. It’s good to switch things up. Back to this adorable seventh grader, newly awakened to the pleasures of whole food. Is it just me, or do many kids experiment with and enjoy new foods only in case their mothers have not cooked or prepared it? My own picky eater has tried foods at others’ tables that he would never give me the satisfaction of trying in my kitchen. Similarly, when I host my kids’ friends, they will often confess that they love the salad I prepared or the kale whatever, but that they never would eat those foods at home. One little girl told me that all she eats for dinner at home is pizza and fast-food chicken, but meantime she devoured a plateful of wild salmon, broccoli, and brown rice. There is a power struggle around kids and food that’s real and underlies many parents’ struggle to entice their kids with healthier fare only to be rejected and manipulated into serving junk so “at least the kid will eat.” I don’t have any easy answers—no one does—but check out Dina Rose’s helpful series of articles on this topic, beginning here. The most important thing is to never stop serving your children healthy options and to continue modeling proper eating yourself. You are giving them an education in how to take care of their bodies when they go out into the world, and education is a slow process. I’m pleased to say that persistence has paid off for me, and that now that my son is fifteen and wants to gain strength, have energy, and look his best, it turns out that mom’s take on good food wasn’t so stupid after all. 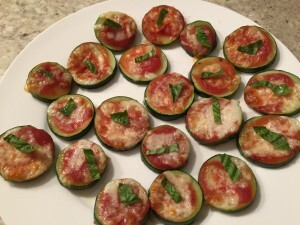 . .
I’ll start this post by confessing that my kids did not like this recipe, even the two among them who love zucchini. That said, I liked it a lot, and why does it always have to be about them? Having been off gluten for a dozen years, I’m always looking at healthy options to get a pizza “fix.” This one was very easy, not to mention healthy and low-calorie. It also helps use up the surplus from your summer garden. Simply slice a firm zucchini into 1/4″ rounds (no thicker) and lay on a sprayed baking sheet. Top each round with a very light dusting of salt and pepper, and small amount of marinara and shredded low-fat mozzarella cheese. Bake about ten minutes at 350F, then top each with a shred of fresh basil. They are delicious and make a great appetizer, lunch, snack, or side dish. It’s pretty astounding how much sugar most recipes include. I frequently see cake recipes that call for 2–3c worth, and assuming you get about 10–12 servings from an ordinary cake, that can be 1/8c (or 8 tsp) of sugar—or more—for every piece you eat. A better plan is for bakers to rely on the natural sweetness of fruit whenever possible. Here’s a recipe for banana cake that has only 1/3c sugar in total, and I’m publishing it only because it has been vetted and approved by all four of my kids. Let me know what your family thinks. Sometimes someone is not ready to hear what you have to say, even if somehow they sense you’re right about something. In my husband’s case, he failed to be ready for over a dozen years to finally hear that his animal protein-based diet was dangerous for his heart and overall health. Indian food is awesome, but it can be intimidating for home cooks with all of its exotic spices, ingredients, and sauces. Also, there’s the perennial issue: will the kids eat it? Here I adapt a simple recipe for dal from Julie Sahni’s Classic Indian Vegetarian and Grain Cooking. My kids are warming up to it, and it’s the perfect dish to serve your vegan friends, or keep on hand for lunch as it will live in your fridge for days. 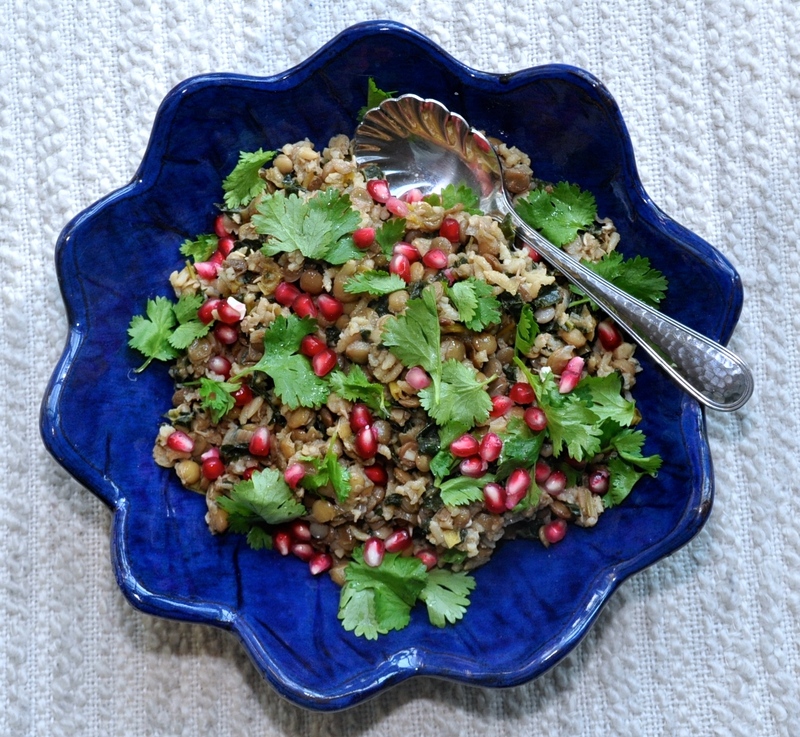 Pair it with naan or any kind of brown rice, and kachumbar salad (recipe below).